Glaucoma is a group of eye diseases that result in damage to the optic nerve and vision loss. Glaucoma is the second leading cause of blindness in the U.S. and the first cause among Black Americans. It affects over 2 million Americans. The disease is more frequent in older people and some forms may be inherited. The most common type is open-angle glaucoma. Less common types include angle closure glaucoma and normal-tension glaucoma. Open-angle glaucoma develops slowly over time. Peripheral vision may begin to be affected early in the disease. If left untreated, central vision may be compromised and lead to blindness. Angle closure glaucoma can present gradually or suddenly. Vision loss from glaucoma, once it has occurred, is permanent. Risk factors for glaucoma include increased pressure in the eye, a family history of the condition, migraines, high blood pressure, and obesity. However, some may have high eye pressure for years and never develop damage. 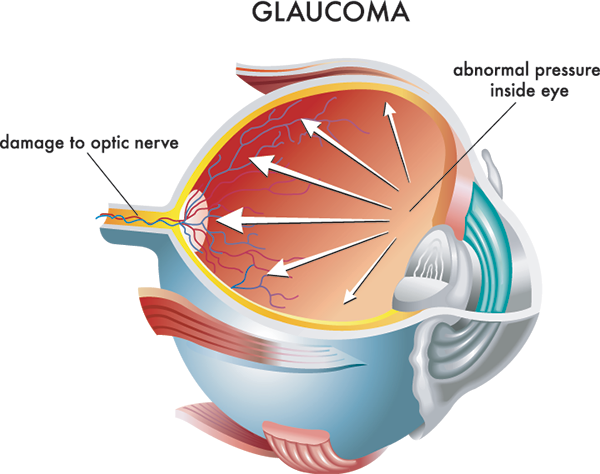 Conversely, optic nerve damage may occur with normal pressure, known as normal-tension glaucoma. If treated early it is possible to slow or stop the progression of disease. Treatment options include medication, laser treatment, or surgery. The goal of these therapies is to decrease eye pressure. A number of different classes of glaucoma medication are available. Different types of Laser treatments may be effective in both open-angle and narrow angle glaucoma. A number of different glaucoma surgeries may be used in people who do not respond sufficiently to other measures. Known as “the sneak thief of sight”, glaucoma is often a silent disease until well advanced. We at Hudson Valley Eye Associates offer the latest in glaucoma diagnosis and management. We have state of the art modalities that can evaluate the status of the optic nerve, assess the visual field and anterior chamber angle. Our lasers are housed in the office to treat open and narrow or closed angle glaucoma. Our physicians are highly experienced at glaucoma detection and we urge all our patients to be screened for this treatable disease.